November 6, 2004 - Another great finish for the team. Fifth place at the Mid-America Fall Classic. May 14, 2004 - The team raced in the Great Mississippi River Adventure Series this weekend taking second place in the co-ed class. January 19, 2004 - We just returned from a nine-day trip to Mexico's volcanoes. I'm putting together the story and pictures, so check back soon to read all about this amazing cultural experience! November 6, 2003 - Read about John and Rachael's epic adventure, The Icegirl Cometh!, as published in the January 2004 edition of Windy City Sports. June 2, 2003 - Raid the North was a first class event, as expected! Read about the race from the Support Crew's view. April 11, 2003 - The Bolingbrook Sun newspaper profiled Team Orange Triangle in this week's issue. The article included a full-color cover photo and three more pictures throughout the article of the team! April 8, 2003 - Team Orange Triangle tasted early season success with a finish at the newly-lengthened 24-hour Great Mississippi River Adventure Series race. Read about the race. September 15, 2002 - Our first Wild Onion is over! Climbing the Sears Tower, kayaking Lake Michigan, canoeing one of the most disgusting rivers in America...what an experience! We covered about 100 miles in 24 hours, but was it enough? Seventy-six teams started and twelve finished. July 31, 2002 - The team had a very successful race at the Mid-America Xtreme in Wisconsin. Two new teammates, good communication, good decisions, adds up to a fun day. Read the story! June 21, 2002 - Expedition race experience comes to Team Orange Triangle! John will be joining Team Chicagoadventureracing.org for the Four Winds Supreme, a seven-day expedition race in Utah from August 17-24. The race will cover 350-400 miles of the Wasatch range, Utah's deserts, lakes, and rivers. Look for a full report here in October. June 10, 2002 - Our third race of the season, the Watertown Adventure Challenge, is history. We had a great time and finished successfully. May 19, 2002 - Bark Lake has as much bite as bark. We got bit, but had a great time. Read about the adventure. 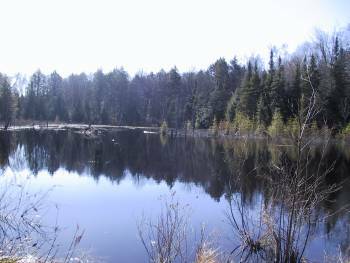 May 2, 2002 - We're off the the Raid the North in Bark Lake, Ontario. See the race webcast live at RaidtheNorth.com. April 7, 2002 - Our first race of 2002 was an exercise in suffering the cold, wind, and rain as a team. Read about the team's success at the Great Mississippi River Adventure Race Series. March 22, 2002 - John Chase will be speaking at the Oakbrook, IL REI store on May 21 at 7 PM. Join him as he introduces the sport of Adventure Racing, equipment, nutrition, and more. January 16, 2002 - Check out the team's 2002 schedule. We're planning 7 races this year with two 36 hour races, two 24 hour events, and three others of varying lengths. December 12, 2001 - We've added Raid the North-Bark Lake to our 2002 schedule! We're still finalizing a few more races, but most of the 2002 schedule is complete. November 23, 2001 - We are proud to announce that Dagger has joined Team Orange Triangle's list of supporters. Thanks Dagger for your help! Check out their line of whitewater and touring kayaks and canoes! November 2, 2001 - Team Orange Triangle is registered for the 2002 Wild Onion in Chicago. Stay tuned for the rest of our schedule coming soon. August 13, 2001 - The team raced in the Pathfinder Challenge in Kentucky this past weekend. An intense race in rough terrain. Only two out of thirty-five teams finished, and on a modified course no less. While Team Orange Triangle was not one of the fortunate two, the race was a great learning experience and we have fun as a team. Read about the race, and learn where you can get your own power beads! July 22, 2001 - Watch for Team Orange Triangle's TV debut on an upcoming episode of Outdoor Wisconsin! We were selected as the "Featured Team" at this weekend's Mid-America Xtreme race. We'll list the show times and dates on this site as soon as they become available. July 22, 2001 - The team scores another successful event at the Mid-America Xtreme in Northern Wisconsin. Good teamwork and determination in the face of a few mishaps brought us from the back of the pack to a respectable finish. Read about the adventure! June 21, 2001 - Mt. Rainier was incredible! Read the trip log and see the pictures! May 27, 2001 - Welcome Ray Daniels as the newest member of Team Orange Triangle. Ray's first Adventure Racing experience was a success, helping the team score our first win. Ray brings triathlon and biking experience, a great knowledge of orienteering, and strong enthusiasm for the sport to the team. May 27, 2001 - Team Orange Triangle WINS!!! With a time of 8:07, we topped the rankings at the Chicago Area Adventure Racing Association Spring Race. The race was held at Skokie Lagoons in Chicago's North suburbs. Bruce Underwood of the CAARA set a challenging course including 30 miles of VERY muddy biking, land navigation, and canoeing. Thanks for a great race Bruce!! April 7, 2001 - The team successfully completed the first race of the year, and the first race for the Great Mississippi River Adventure Race series. In the surprising 90 degree temps of early April, we finished a respectable 11th place. Mike Ehredt and team did a great job putting together one of the most participant focused events I've ever attended. For a new team looking to find out about Adventure Racing, or an experienced team looking for a well-organized event and an opportunity to brush up on some skills, join the GMRAS! April 3, 2001 - A third race has been added to the schedule for 2001. We'll be racing in the Great Mississippi River Adventure Race this weekend. A sprint race, expected to last between 6-10 hours. We're looking forward to getting together as a team and sharpening the skills for the coming season. March 30, 2001 - John wrote an article for a corporate newsletter about the parallels between an adventure racing team and a group of securities processing team. 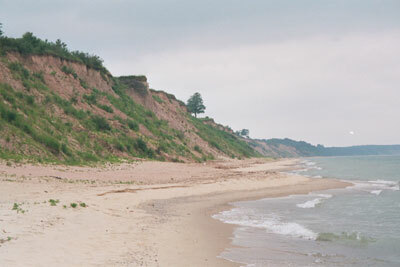 March 12, 2001 - Team Orange Triangle will be leading three training events with the Chicago Area Adventure Racing Association this summer, including a night land navigation clinic, a night biking event, and a mini training race at Palos Hills Forest Preserve (Southwest Chicago suburbs). We're proud to be associated with the CAARA. Check out the group's 2001 events schedule. March 5, 2001 - We've confirmed two races for the 2001 season, in addition to the Rainier trip. We've registered for the Pathfinder Challenge, a 48-hour event in the Daniel Boone National Forest, and the Mid-America Extreme in Northern Wisconsin. We're considering a couple of smaller events around the Chicago area and maybe the Wild Onion in September. January 28, 2001 - We've had a very successful trip to the Outdoor retailer show in Salt Lake City, UT this weekend. Thanks to Camp, Bridgedale, LED Lite, and Vaude for your support of Team Orange Triangle and Adventure Racing. Stay tuned as more co-sponsors join the group over the next few weeks! 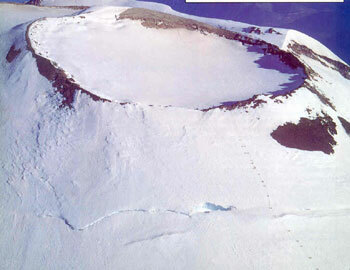 January 24, 2001 - The Rainier expedition is confirmed for June 4-8! We'll be spending five days on the mountain learning glacier travel, high-altitude climbing techniques, and rescue skills, along with an attempt on the 14,410 ft. summit. January 2001 - The team is preparing for the upcoming season. The schedule so far includes the Mid-America Extreme in July and the Pathfinder Challenge in August. We're also gearing up for a summit attempt on Mt. 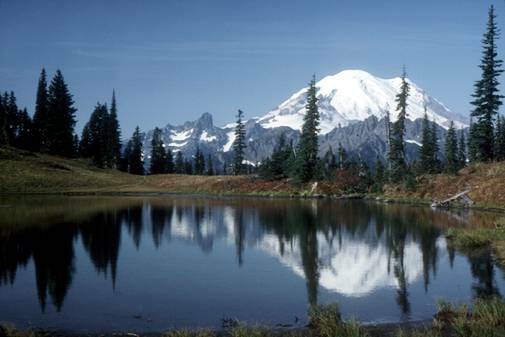 Rainier in June! October 7-8, 2000 - We competed in the Odyssey. The race kicked our butts, but not our spirits. We had a great time and we're looking forward to visiting Don Mann and the Odyssey Team (and conquering that race) in 2001. Read the story. September 30, 2000 - You can now find us at our new home on the Internet at Teamorangetriangle.com! August 4, 2000 - We've entered the Odyssey 24 hour race in Virginia and are preparing for October! 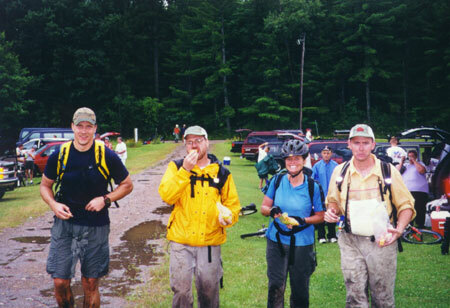 July 30, 2000 - Team Orange Triangle completes the Mid-America Extreme in Northern Wisconsin. Read all about it! 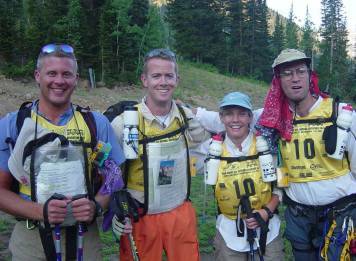 June 25, 2000 - Team Orange Triangle completes our longest race to date, the Pathfinder 2000. 16th place out of 42 teams! Follow the team on our adventure! June 1, 2000 - John McInnes joins Team Orange Triangle. May 21, 2000 - Training weekend in Wisconsin preparing for the Pathfinder 2000. Night biking followed by a 8 hour night hike in the pouring rain. It doesn't get much better than this! March 30 - April 2, 2000 - Training weekend in Northern Michigan preparing for the Pathfinder 2000. February, 2000 - Yvette McKenzie moves to France. Semi-retired but will be back with the team again. Good luck in France, Yvette and family! October 12, 1999 - Pathfinder Challenge. We gave a great effort, but just missed the cutoff for time and didn't complete the race. We had a great time, learned a lot, worked extremely well together as a team, and made some good friends. August, 1999 - Sean Carey and Yvette McKenzie join Team Orange Triangle. July 31, 1999 - Successfully completed in the Pathfinder/Transplant Challenge, finishing in 4th place. We even made the front page of the Chicago Tribune! See the Sponsors page for the picture. April 12, 1999 - Competed in our first race, the Pathfinder Challenge, in Manistee National Forest in Michigan. March, 1999 - Cindy Kienlen joins Team Orange Triangle. 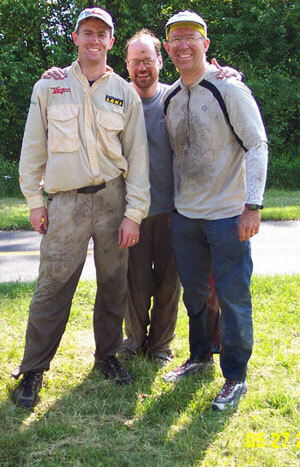 October 11, 1998 - Randy and John volunteer for the Pathfinder Challenge in Kettle Moraine State Park, Wisconsin. We're hooked! Copyright TeamOrangeTriangle.com. All Rights Reserved.